A lot has changed in three starred dining in France. For one, the stuffiness has been shed and environments appear to be less important to the rating than they used to be. The focus has become more on food, intelligent service and outstanding wine lists. This is not to say that exquisite locations no longer exist, they do, but, often in our recent starred dining experience in France, these spectacular environments are propping up a less than amazing dining experience. Alain Passard’s Arpège is a testament to the change in starred dining in France. Arpège is not housed in an opulent environment, in fact far from it…the tunnel cave where we were seated is, if anything, claustrophobic and far from glamorous. Tables are crammed in a very un-three Michelin starred way. This is not a complaint, but merely stating a fact…a fact, that did not in any way diminish our enjoyment. We list Arpège as our best three Michelin stars in the 15 we recently ate at. 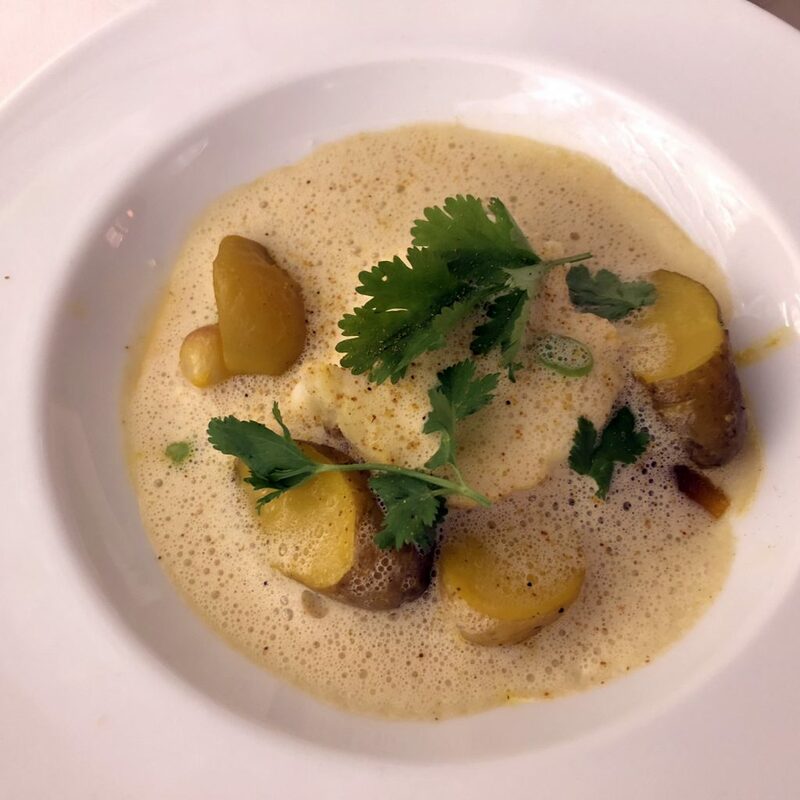 Pierre Koffman’s long closed Tante Claire has remained, over many years, my number one three starred dining experience and I felt that Arpège was in the same league when it came to the enjoyment of the food. We totally respect that regular diners were given premium positions in the upstairs area of the restaurant. It is these regulars, that in a global downturn, when tourism guests drop to almost nothing, who help an establishment like Passard’s Arpège survive. We urge you to remember this when considering whinging about your table; remember Arpège is a hallowed hall of dining and the focus is on the food not the environment. The French have never been great on vegetable, often preferring to serve it as a separate course rather than in proportion with protein and to be fair in recent starred dining this remains disappointingly so. This fact, makes the success of Passard’s Arpège especially interesting because his menu is 90% vegetarian. The wonderful flavours of Passard’s food are supported by their organic gardens and devotion to local and seasonal. 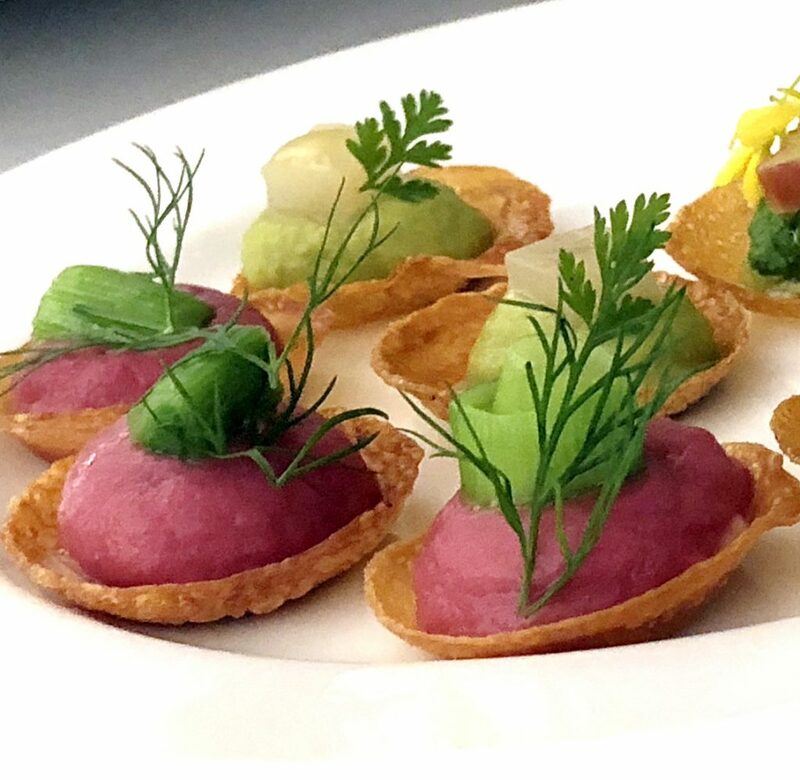 The amuse-bouche, three exquisite little tarts of the finest, crispiest pastry…beetroot, asparagus and spinach garnished respectively with dill, chervil and yellow rocket flowers. The pastry was so fine, it appeared to be a spring roll wrapper and, we must say quite the fashion, as we found the same paper-thin pastry in all of the three stars we ate at and at one star as well. These divine little morsels need to be consumed as soon as they arrive because the pastry softens almost immediately. A good salad is never a simple thing and this salad was perfection. Not too large or too small, a mix of leaves, herbs and flowers, finely sliced radish, roasted hazelnuts and compressed fruit, delicately dressed with a nice puddle of green sauce at the bottom that could be mixed through or left alone. Next came the classic steamed egg yolk with whipped cream fraiche and chive, and for a moment I couldn’t help wondering where the caviar was until I’d eaten the first mouthful….the freshest of egg it was perfect and the temptation to run my finger around the inside of the empty shell to scrape out the very last morsel was barely resisted. Sometimes when very small dishes make an appearance on a menu the time between that and the next course can be too short or too long…at Arpège this was perfectly handled and because the food was so wonderfully balanced it was possible to look forward to the next course of what was, a very long and generous, chef’s menu. Three raviolis, beetroot, radish and rocket with a skin more like the Chinese gowgee skin than pasta. 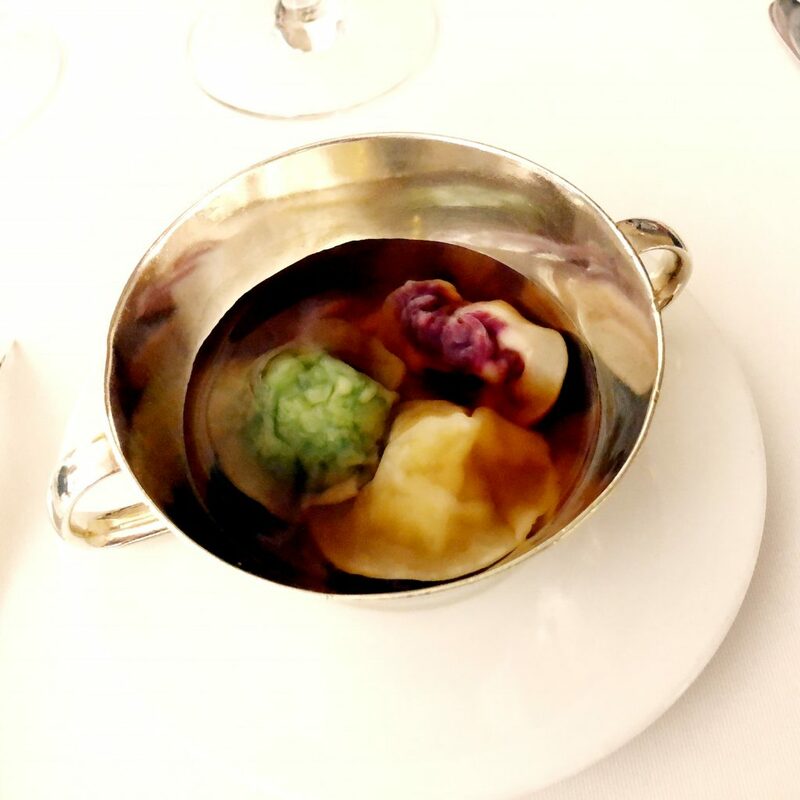 The vegetable consommé was delicately flavoured with ginger. A wonderful dish with sublime, subtle individual flavours. One of the day’s specials was a scallop carpaccio and included in the chef’s menu. Fresh scallops are rarely seen in Australia and this was perfect. Finely shaved Romanesco and radish, chervil and chive, properly and perfectly seasoned with a tiny amount of olive oil subtly infused with geranium with a back hint of lemon. Again, total respect for the product and a nice little introduction of early spring produce with the finely shaved raw Romanesco. No salt or pepper required, infact, additional seasoning was not ever required! Again, very pretty! Three vegetable stuffed gnocchi they had been lightly fried to give them a little crispiness and trawling them through the anchovy and parmesan flavoured cream and the stunning sorrel sauce that was kept a vibrant green with parsley with the tiniest hint of mint that foiled the bitterness of the sorrel. This dish was a stand out! Small, perfectly portioned this is just one of the many dishes we were served that demonstrated the change in French cuisine. You could call it fusion, but I think it is more evolvement; the result of the opportunity to travel in combination with the influence of immigration. A tiny Nigiri style nub of sushi rice, perfectly finished with mirin and a little lemon, a paper-thin slice of briefly blanched and marinated Chioggia beetroot and a tiny spiral of exquisitely fine black olive prepared tapenade style. Demolished in an instant it left you wishing there were more. The gorgeous gold line coupes reflected the deep emerald of the nettle and sorrel that was so subtly infused with the farm spek that it took a spoonful or two to register that this was not an entirely vegetarian dish…mixed with the whipped cream fraiche that was infused with horseradish we scraped our bowls clean, sighing all the while with pure delight. More beetroot but presented in an entirely different way…a funny take on the ‘vegi burger’ of the late 60s with much more complexity, texture and flavour., with a smoked tomato sauce that was tasty and intriguing, all complimented with a light frothy creamy sauce. Monk fish another of their daily specials was nicely proportioned in a very un-French like manner with harmonious protein and vegetable. The stars of the dish were the just dug potatoes and a lovely delicate sauce infused with a restrained hand of porcini with an almost imperceptible smattering of freshly ground nutmeg. Add to that a few peeled spring broad beans, a few slithers of porcini and coriander garnish. Plainly presented it was impossible to resist mashing the potatoes into the scrumptious subtle sauce. By this time, we are cooing happily like fat old pigeons sitting in the sun on a cathedral roof. Not a foam or gel in sight…praise the lord!!! Nothing silly that has given way to stupidity for the sake of appearance; a complete focus on flavour. The Hazelnut soufflé was exquisite and perfectly portioned, but where was the perfect ice cream to compliment it? Floating Islands are one of the French staple desserts found in various incarnations on almost every menu regardless of price. The excessive use of verbena and other Australian indigenous ingredients in early 80s Australian menus has left many of us scarred for life. Most recently we have seen these ingredients come of age with the skilled hand of chef Jock Zonfrillo in his restaurant Orana in Adelaide South Australia. The island was the ice cream and more coffee than the expected mix of coffee and chocolate it was delicious. Not being a fan of verbena and although it was so subtly scented with cardamom, I couldn’t help wishing that the verbena flavoured crème anglaise had been coffee and cardamom instead. It has to be said that both desserts were made all the more delicious because of the lack of sickly sweetness that is found in so many desserts these days. The petit fours that followed were equally faultless, featuring pistachio macaron, tuilles that were really more brandy snap, with a delicious smattering of crushed nuts, soft and chewy Russian caramels, a miniature rhubarb tart with perfect pastry, a lusciously crispy crumbly apricot studded iced slice, a little chocolate nut studded toffee. Coffee was terrible and we were astonished to be told it was made with capsules. Best not order coffee. It needs to be said that coffee in France mainly remains in the dark ages and probably best avoided where ever you go and regardless of the amount of stars or not! If there is a small overall comment about this delicious and interesting food at Arpège, it is the lack of solid unprocessed vegetable texture. We forgive the excess of beetroot, noting they must have had a garden abundance, but, delicious as it was, there was rather a lot of it. The chef’s menu Arpège, was without challenge, the most consistently excellent of the three starred cooking we enjoyed in our recent trip to France. This is not to say we didn’t eat many marvellous dishes that exhibited wonderful cooking skills, we did, but very often it was just one or two dishes of many rather than the entire menu. It was the only starred restaurant we ate at where protein, when served, was in proportion with vegetable for modern cooking. If you are a dedicated meat eater Arpège may not be the place for you …however, this restaurant comes highly recommended! Thanks to Arpège’s Fleur…for kindly clarifying questions about the dishes we ate. It is hard to compare wine lists as it is to compare restaurants and their food. Each list has its own strengths and weaknesses, very often a testament to the passion and preferences of the head sommelier. There is not a lot to choose from unless you are willing to spend big and we acknowledge that wine sales are an important budgetary part of keeping restaurants like Arpège in existence. It was clear from the outset that the head sommelier was hard at work upstairs and the first young sommelier understandably lacked confidence and experience. Luckily our Champagne expert chose a brilliant bottle and the second young sommelier immediately sensing a higher level of knowledge and disappointment with the second recommendation summoned the senior sommelier…all to the delight of our Burgundy drinking companion who enjoyed challenging his knowledge. If you have extensive knowledge we suggest you immediately ask for the head sommelier and be prepared to be patient because with a full restaurant he/she will surely be busy. For those of you with great cellars at home comparing what you have paid for the same bottle is pointless. At a restaurant they have to cellar the wines, provide exquisite glassware and knowledgeable service and you have to pay for that. So, you have a choice, spoil your experience by ordering one or two glasses from the bottles they have opened or go with the flow and put your money on the table and have the totally fabulous restaurant experience. When it comes to housekeeping, toilet checks were in short supply and for some 30 minutes towards the end of lunch the downstairs toilets remained without hand towels and toilet paper…unforgiveable given the price and the stars! Making a reservation when there is such a long, time difference can be tricky, but most restaurants now have on-line booking services and it is generally clearly explained when reservations start etc., setting the alarm and getting in early is just a fact of life and it is worth the effort.